The pattern is from my collection of vintage knitting patterns. 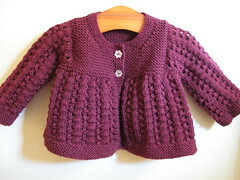 I would like to work this up larger for my little girl in the same colour. It really suits her skin tone. I love the yarn and will use it again, soft with great stitch definition and machine washable. Now we’ve lost Jaeger….this is a good alternative to Matchmaker Merino. I just scraped in with nothing to spare on this one. A fiddly bit of sewing up, but I like that part. Maybe next time I’ll work it in one piece to the armholes. Mods: I omitted a button and the filet ribbon around the neck, not practical or safe! Oh, and I compensated by adding extra stitches to the seam edges so the pattern appeared seamless on the side seams.